Katie Fyfe | The Journal Gazette The Komets' Phelix Martineau chases after the puck against the Toledo Walleye at Memorial Coliseum. 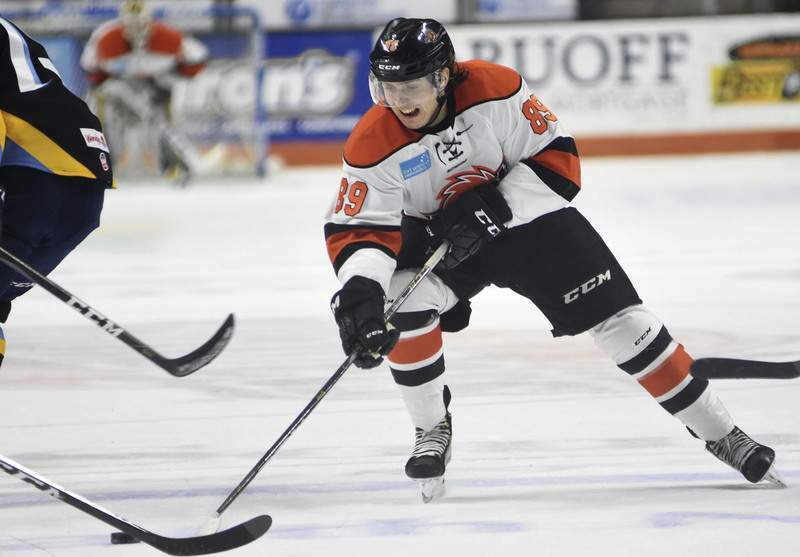 The Komets had hoped to get Phelix Martineau back from the American Hockey League for Game 3 of the Central Division semifinals, but he's day-to-day with an upper body injury that was suffered in Laval's penultimate game. He cannot be reassigned to Fort Wayne until he's healthy. He had four assists in 30 games for Laval, 12 goals and 21 points in 23 games for Fort Wayne in the regular season. Meanwhile, the Toledo Walleye could have defenseman Trevor Hamilton in the lineup. He had one goal and three points in 17 games for Grand Rapids of the AHL, five goals and 14 points in 28 games for the Walleye. Toledo leads this series 2-0 heading into the 7:30 p.m. game at Memorial Coliseum on Wednesday.